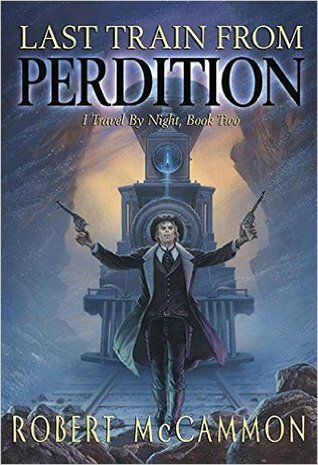 REVIEW -- Last Train from Perdition is the sequel to I Travel by Night where we're introduced to Trevor Lawson, a vampire who happens to be a hired gun. Lawson is in the process of "turning", but he's fighting the urge for blood and trying to remain human. This sets him on a trail for LaRouge, the lady who bit him. By drinking every last bit of her blood, the vampire gunslinger can revert to human form. But Lawson has been hired by a rich family to track others. In Last Train, he and Ann are bound for Perdition in the great Northwest to bring home a wayward son. Honestly, a vampire gunslinger would never have appealed to me -- except that the story is told my Robert McCammon. Enough said, in my book. McCammon has a way with words -- a way of storytelling that most of us can only hope to achieve. Last Train is no different. I must say, the ending was a bit over the top, to me anyway. But the atmospheric descriptions along the way make the book very enjoyable. If given the option, I'd render 3.5 stars only because of the ending. But that's just me.